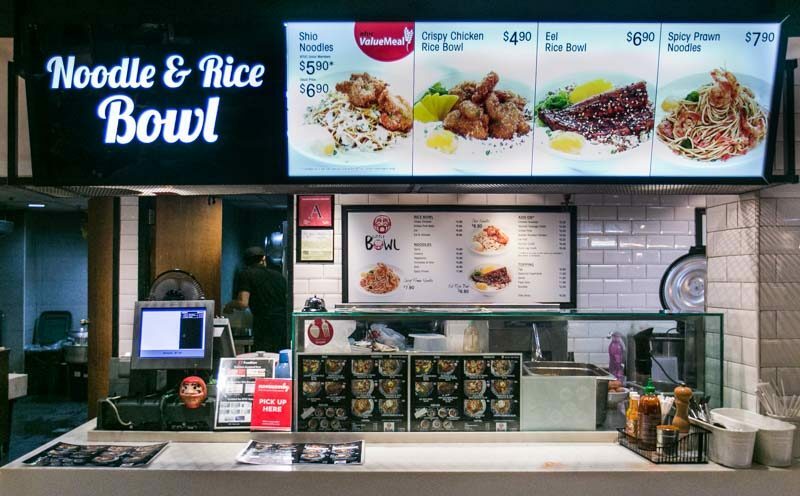 Who would think that this unassuming “Noodle & Rice Bowl” stall in NTUC Foodfare’s Food Emporium would serve up such amazing grub? 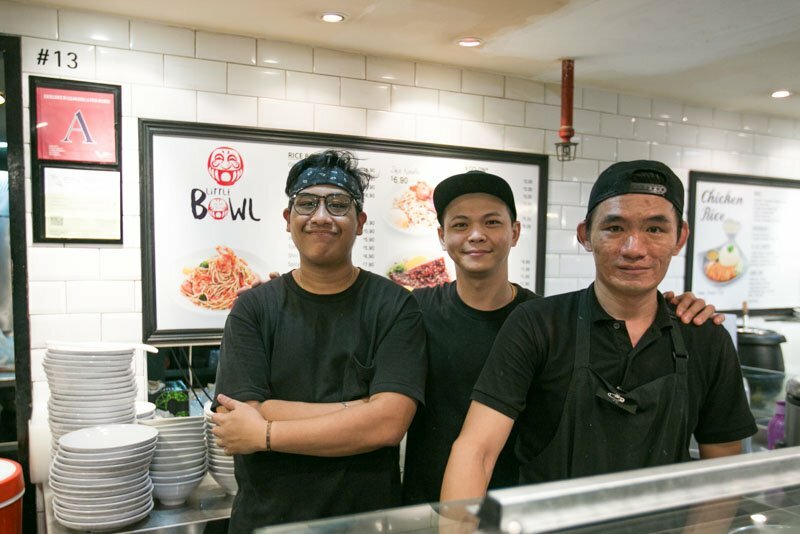 This humble eatery, Little Bowl, is located in the basement of Clifford Centre and was started by three young hawkerpreneurs. 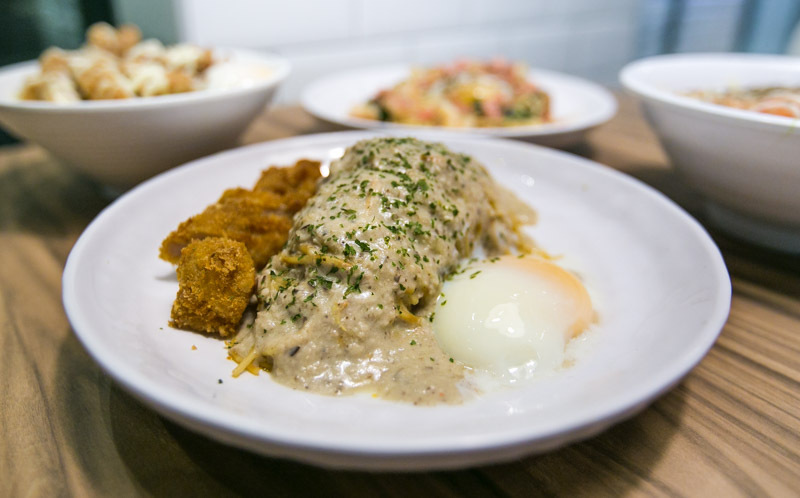 Kurt, Yew Tee and Wai Loon’s paths converged during their stint at Saveur. Shortly after the founders of Saveur sold the business and went their separate ways, these three young men decided to venture out on their own. 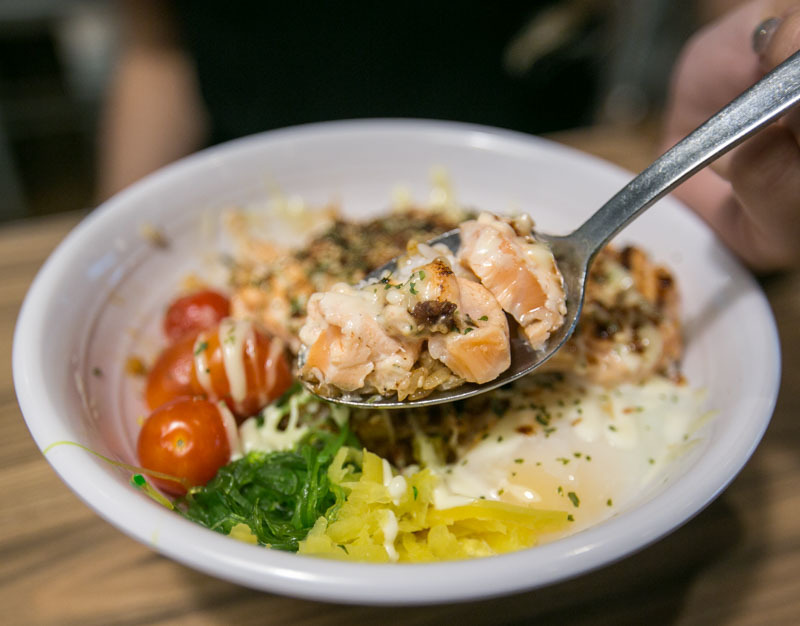 After a brief hiatus to rebrand their initial venture, Le Bouillon, they reopened Little Bowl earlier this year. The trio revamped the menu, offering items that they felt was more suitable for the office crowd — affordability and convenience were their key considerations. They arrive at the stall 7 am daily, three hours before opening hours, to start their preparation for the day. In order to maintain strict quality control over each and every single dish, the portions are prepared individually. 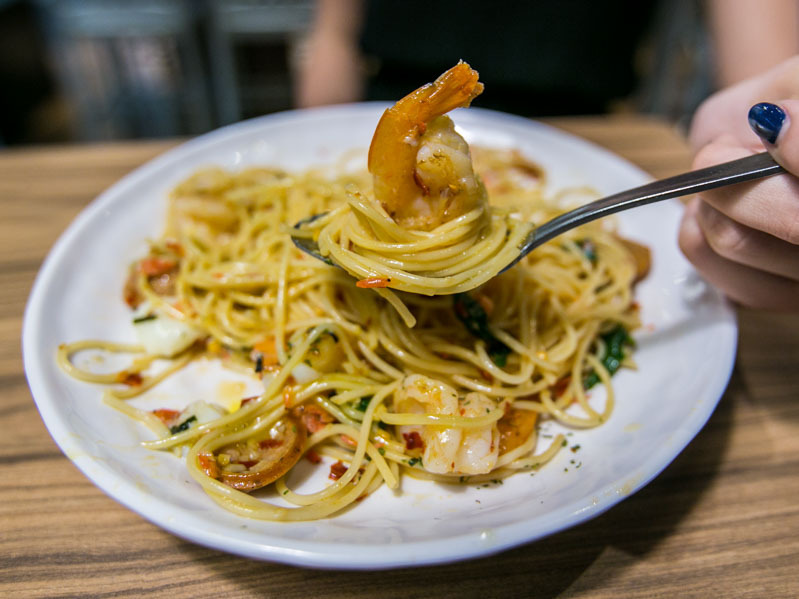 The first dish we had was the Spicy Prawn Noodles ($7.90), which vaguely reminded us of Saveur’s signature pasta. 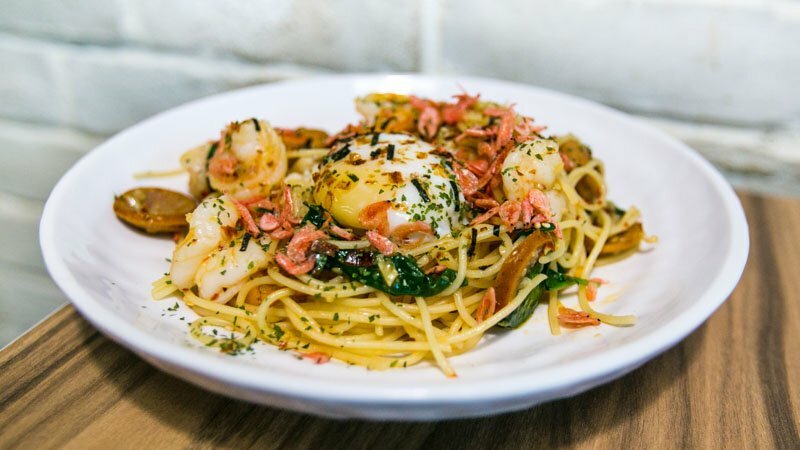 The al dente angel hair pasta is tossed with thinly-sliced chorizo sausage, fresh prawns and chilli oil. 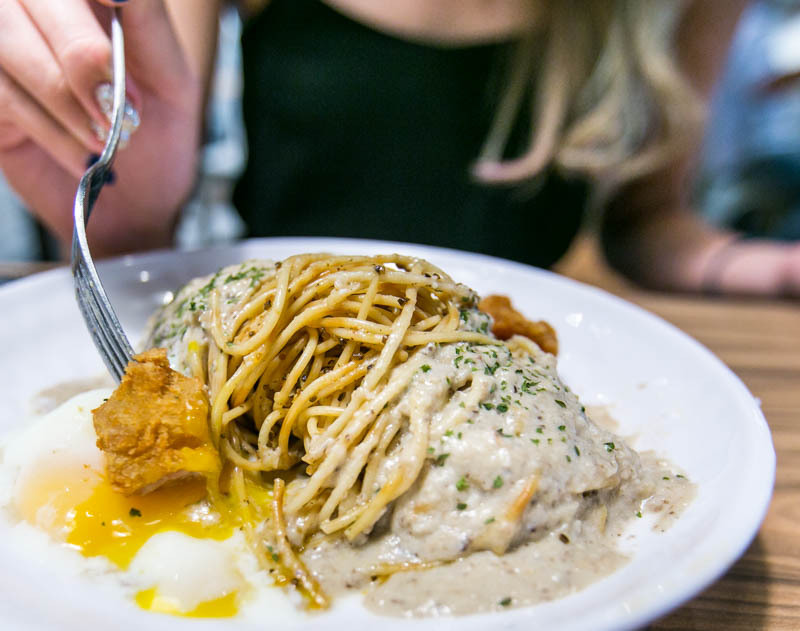 wobbly onsen egg is perched on top of the hearty serving of pasta and sprinkled with sakura ebi. 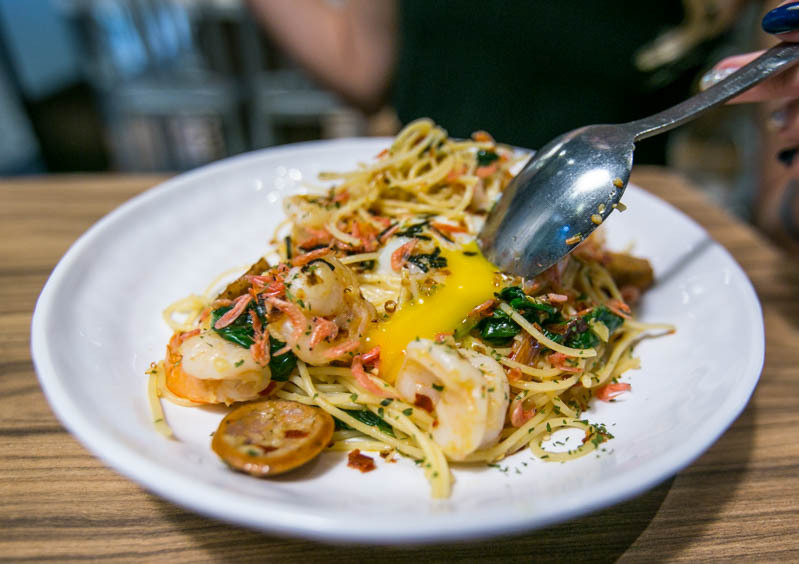 We loved how this Aglio olio came with an abundance of ingredients. It made the already flavourful pasta even more savoury and wholesome. Even after mouthfuls, we did not get bored of this delectable combination. Next up, was the Value Meal Shio Noodles ($6.90). The springy pasta is twirled and cloaked with a thick and creamy sauce made out of kombu (kelp), marinated crab meat and shiitake mushroom. Like the previous dish, the noodles itself was already fairly fragrant, but the earthiness of the mushroom and fresh, oceany taste of the crustacean from the sauce further elevated the taste of the pasta. The crispy chicken cutlets on the side gave the dish a textural contrast. Try dipping the morsels of chicken into the luscious pool of egg yolk, then pair it with a spoonful of the pasta; it was a superb combination. Moving on to the rice bowls, we had the Crispy Chicken Rice Bowl ($4.90). 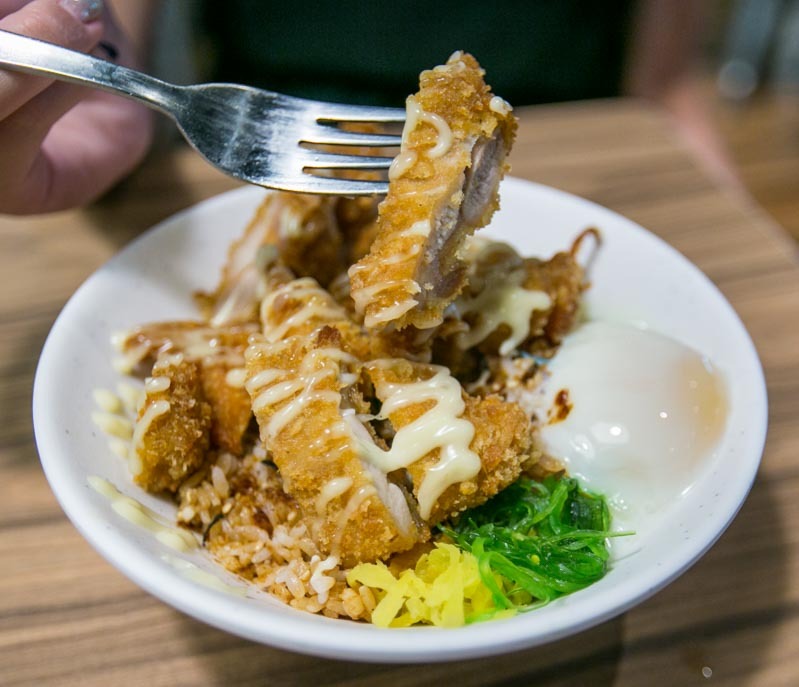 For just $4.90, this rice bowl came with a significant portion of chicken cutlet. Like the rest of the rice bowls, it was topped with an onsen egg and came with sides of pickled radish and wakame. The rice is served with a light, yet refreshing sauce which is a combination of yuzu, teriyaki, soy sauce and a subtle hint of chilli oil. 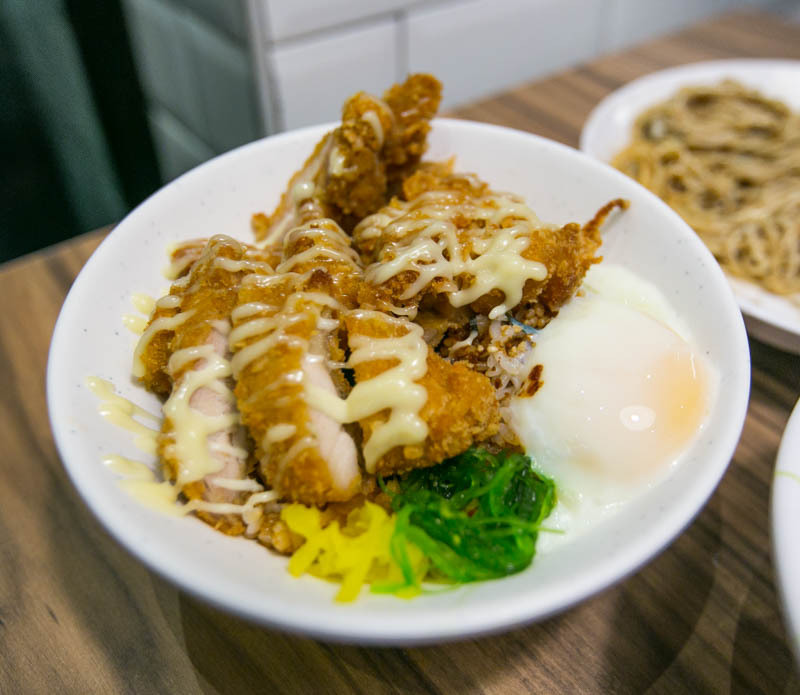 The tender golden-brown chicken cutlet is drizzled with yuzu mayonnaise sauce. As I’m not exactly fond of yuzu, I must say that thankfully, the piquant flavour of the Japanese citrus was not too overpowering. In fact, it would have been great if they could have given more sauce. I liked how the tanginess of the yuzu mayonnaise helped cut through the greasiness of the chicken cutlets, preventing it from becoming too jelak. 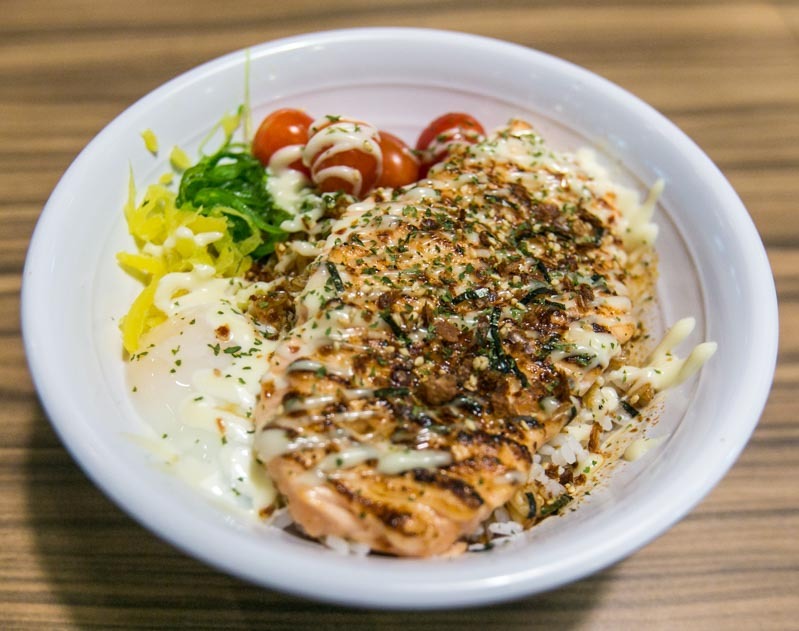 Finally, the most anticipated dish — the Mentaiko Salmon Bowl ($7.90). Mentaiko? Aburi salmon? Less than $8? Say no more, we’re definitely ordering this again when we’re back. I’m pretty sure the fact that we devoured the entire torched fillet within two minutes is a testament to how mind-blowingly good it is. The melt-in-your-mouth texture and light char taste of the salmon, combined with the appetising mentaiko sauce won our hearts (and taste buds). The chefs definitely have good control over the blowtorch, as despite being flame-torched, the salmon still remains succulent and moist on the inside. However, do note that as this is a daily special, there are very limited portions sold daily. If you’re having major cravings for their mentaiko salmon and do not want to miss it, you can even make reservations for it before heading down. 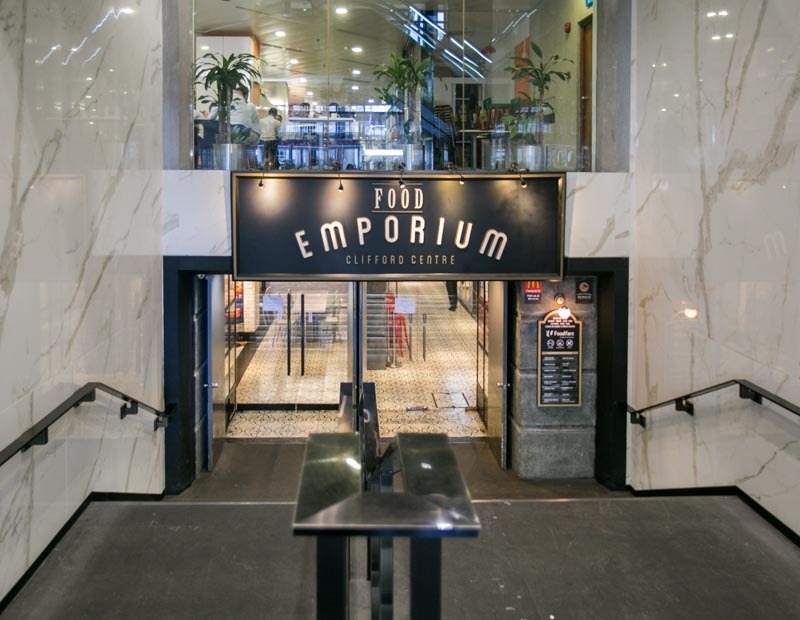 We thoroughly enjoyed our meal, and needless to say, if we ever find ourselves around CBD area, we would definitely make our way to Clifford Centre for our (fairly cheap) fix of quality pasta and rice bowls!